This summer really flew by for a few of our ESRM students! The Student Undergraduate Research Fellows program, more commonly known as SURF, is a program run by Dr. Sean Kelly that allows students to get paid to do research in a field of their interest. Professor Cynthia Hartley led a group of four ESRM students: Matt Wells, Cassie Rogers, Jason Suddith, and Kaitlyn O’Dea, in conducting research on the viability of several mitigation methods aimed to address the endangerment of the Western Snowy Plover and the California Least Tern on Ormond Beach in Oxnard. These shorebirds have been critically endangered for years. The project, which took place over a two month time period, is quite multidimensional. The first part of the two-fold project involved spatial and temporal analyses of nesting snowy plovers on Ormond Beach. The second part explored the use of drones as a viable tool in monitoring nesting birds. The team theorized that drones would inflict less of a disturbance on the shorebirds than would traditional nest monitoring, which requires humans to come in close contact with the nests and thus inflicts higher levels of disturbances upon the birds. Both of these methods were practiced throughout the research to adequately compare, contrast and quantify the impacts of the two means of monitoring. Each student took on a separate role, which they upheld throughout the duration of the program, to find effective methodologies for observing and monitoring these endangered shorebirds. Matt Wells tested the viability of drones as a management tool to monitor the shorebirds as an alternative to traditional monitoring methods. The goal was to document the reactions that the birds had when the drones flew above their nesting sites and to scale their reactions from 1 to 5. Matt was also responsible for mapping the geomorphology of Ormond Beach, which was done using a variety of different drones, including a DJI Inspire 1, a Phantom 4, and a Mavic Pro. A thermal imaging device was utilized to do population counts of the birds. Cassie Rogers utilized trail cameras to determine the shorebirds’ most common predators and to determine the volume and frequency of predated nests. Trail cameras were placed on the nests, and after about one to four days, Cassie would upload the data from the cameras and then categorize and graph the data. The pictures taken on the cameras will be used to show decision makers like California Fish and Wildlife what the common shorebird predators are on Ormond Beach. Jason Suddith, along with performing various technical support duties throughout the duration of the research, primarily analyzed and displayed the spatial and temporal data associated with shorebird nesting patterns and habitats. A waypoint was taken with a GPS at each active nesting site following serpentine transects along the beach. These waypoints, once collected and organized, are then to be displayed on a map for the purpose of tracking the nest throughout its lifespan. Jason was also instrumental in quantifying the level of disturbance (on a scale of 1 to 5) that the birds were subject to as a result of drone flights over their nesting sites. Kaitlyn O’Dea took the lead on monitoring the California Least Tern, specifically exploring the density and distribution of their nesting locations and seeking a possible correlation between the location of their nests and the level of success of chick hatches. Kaitlyn practiced traditional nest monitoring methods in order to determine any possible trends and correlations along with the utilization of statistical methods. Initial results following the research showed that the shorebirds were almost oblivious to the drone. Most birds experienced a level 1 to 1 ½ reaction (per the scale previously mentioned) indicating that they experienced negligible disturbances. None of the birds perceived the drones as enough of a threat to flee their nests. In regards to the use of trail cameras as predation monitors, findings supported that ravens are the primary predators of the shorebirds. Mitigation methods to reduce disturbances caused by ravens will continue to be explored. This research serves as a foundation for further exploration into the use of drones as viable tools for shorebird nest monitoring. 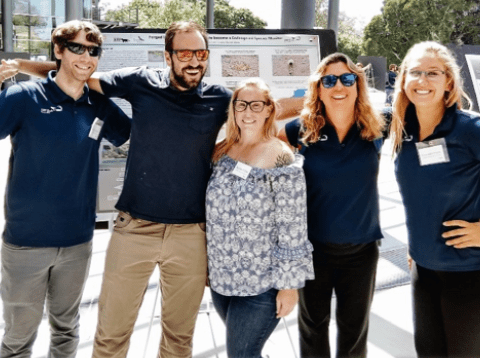 We are immensely proud of Professor Hartley and the students involved for the substantial data that they have collected and for the notable contributions they have now made in protecting the endangered Western Snowy Plover and California Least Tern on Ormond Beach. This entry was posted in curriculum, internship, News, Professors, Student Internships. Bookmark the permalink. THIS IS SO AWESOME LISA! AND SURF BIRD TEAM!